The etymology of Montfort's "Seraphs" is not clear. The closest interpretation is the word seraph: A seraph ("the burning one"; pl. seraphs or seraphim is a Hebrew-origin word referring to a type of celestial or heavenly being originating in Ancient Judaism. The singular "seraph" is a back-formation from the Hebrew plural-form "seraphim", whereas in Hebrew the singular is "saraph" see Wikipedia Seraph. Monfort used the French Seraphe and the latin Seraphs, see below. If the etymology of Montfort's "Seraphe"/"Seraphs" from the hebrew is accepted, the stem of the word is "seraph", and the family name created by Jung, 1974 should be emended to Seraphidae. Diameza and Miniseraphs are treated as subgenera by Jung, 1974. G. Rosenberg: the correct spelling of the family name is Seraphidae, not Seraphsidae. The genus Seraphs was named by Montfort, 1810. He did not give a derivation, but gave the French equivalent as "Seraphe". Therefore it is clear that the final "s" of Seraphs is not part of the root of the word. "Terebellum and its relatives have usually been assigned to the family Strombidae. However, already De Gregorio (1880, p. 19) grouped them together under the subfamily Terebellinae and Sacco (1893, p. 21) used the family name Terebellidae. This fact has either not been accepted by western workers, or it has been overlooked. On the other hand some eastern workers followed Sacco and considered the Terebellidae as an independent family within the super-family Strombacea (Mészáros, 1957, p. 44; Bagmanov, 1966, p. 178; and others). All these authors obviously considered Terebellum as the type genus of the family. Unfortunately the name Terebellidae is preoccupied by the polychaete family Terebellidae, the type genus of which is Terebella Linné, 1767. Grube (1851, the two tables in front of p. 281, pp. 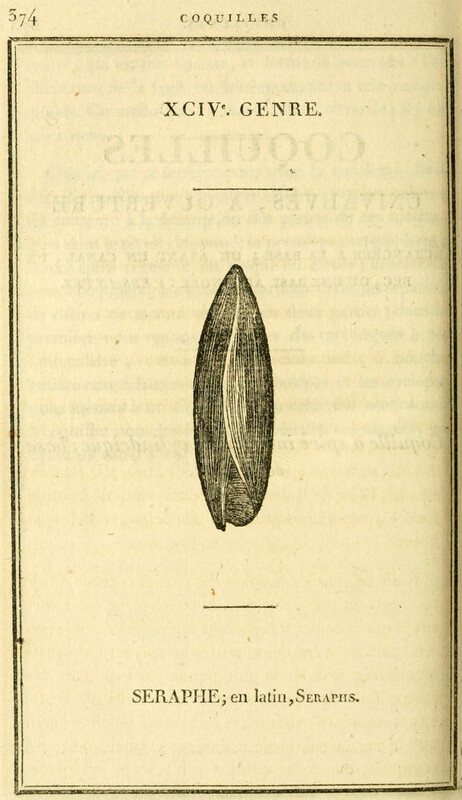 281, 325) called the family Terebellacea and Malmgren (1868, p. 216) Terebellidae. The polychaete family name has, therefore, priority, and the gastropod family needs a new name and another type genus. I herewith select Seraphs Montfort, 1810, as the type genus of the gastropod family and derive the family name Seraphsidae from it." "Reference: Annals and Magazine of Natural History, ser. 2, 11: 131"
"Remarks: Original spelling (subfamily) Seraphina, based on Seraphys, an incorrect subsequent spelling or an unjustified emendation of Seraphs. Spelling Seraphyinae used by Gill (1871: 9). Seraphsidae introduced independently as a replacement name for Terebellidae by Jung (1974: 12)"
"Type genus: Seraphs Montfort, 1810: type species: Terebellum convolutum Lamarck, 1802; OD; France, Eocene"
"Terebellinae H. Adams & A. Adams, 1854 [January]"
"Reference: The genera of Recent Mollusca, 1: 262"
"Type genus: Terebellum Lamarck, 1798; type species: Bulla terebellum Linnaeus, 1767; by subsequent tautonymy, Röding (1798: 135); Indo-Pacific, Recent"
"Remarks: -idae, Sacco:1893: 64). Homonym of Terebellidae Grube, 1850, based on Terebella Linné, 1767 [Polychaeta]; see Seraphsinae." "Seraphsidae included in Strombidae by Wells (in Beesley et al., 1998)." "1853 Seraphina Gray, 11(62), p. 131. Type: Seraphys Gray, 1847 (= Seraphs Montfort 1810). Subfamily of Strombidae." "= 1871 Seraphyinae Gill, 1870 ex Gill, 227, p. 9. Type: Terebellum terebellum Linné, 1758. Synonymized - Emendation of original name Seraphina Gray 1853." "= 2005 Seraphidae[sic] Gray, 1853 ex Bouchet & Rocroi, 47(1-2), p. 253. Bandel, 2007, C 524, p. 136. Type: Seraphs Montfort, 1810. Synonymized - Emendation of original name Seraphina Gray, 1853. Excluded - ICZN (1999) article 35.5 which rules that the elevation of a subfamily shall not displace the name given to a family, even if that subfamily has precedence: “Precedence for names in use at higher rank- If after 1999 a name in use for a family-group taxon (e.g. for a subfamily) is found to be older than a name in prevailing usage for a taxon at higher rank in the same family-group taxon (e.g. for the family within which the older name is the name of a subfamily) the older name is not to displace the younger name” (ICZN 1999, Article 35.5). Furthermore, Article 50.3.1 is not applicable to argument for relegation of Seraphsidae Jung as it makes two base assumptions: first, that Gray (1853) made a spelling error, which cannot be substantiated; and second, the question of priority here does not deal with an intrasubspecific taxon, being the retrospecive elevation of a prior subfamily name to replace a later family name after 1999 (Article 35.5), and is therefore an argumnet of priority at rank." "= 2010 Seraphsidae Gray, 1853 ex Bouchet et al., 2017. Type: Terebellum Bruguière, 1798 (= Terebellum Röding, 1798). Synonymized – Emendation of original name Seraphidae Gray, 1853 ex Bouchet and Rocroi, 2005." "= 1858 Terebellinae Adams & Adams, p. 262. de Gregorio, 1880, Fauna di S. Giovanni Ilarione, p. 19. Type: Terebellum terebellum Linné, 1758. Excluded - Preoccupation = Terebellinae (Polychaeta, Terebellidae)." "= 1893 Terebellidae Sacco, p. 21. Type: Terebellum terebellum Linné 1758. Excluded - Preoccupation = Terebellinae (Polychaeta, Terebellidae)." "= 1974 Seraphsidae Jung, 7, p. 12. Caze et al., 2010, 32(3) p. 426. Type: Seraphs Montfort, 1810." Bouchet, Philippe; Rocroi, Jean-Pierre; Hausdorf, Bernhard; Kaim, Andrzej; Kano, Yasunori; Nützel, Alexander; Parkhaev, Pavel; Schrödl, Michael; Strong, Ellen E. (2017). "Revised Classification, Nomenclator and Typification of Gastropod and Monoplacophoran Families". Malacologia. 61 (1–2): 1–526. Maxwell, S.J., Liverani, V., Rymer, T.L. & Congdon, B.C., 2018. A revision of Terebellum delicatum Kuroda and Kawamoto in Kawamoto and Tanabe, 1956 (Gastropoda, Seraphsidae); Proceedings of the Royal Society of Queensland 123:61-67. Montfort P. [Denys de]. (1808-1810). Conchyliologie systématique et classification méthodique des coquilles. Paris: Schoell. Vol. 1: pp. lxxxvii + 409 , Fulltext. Vol. 2: pp. 676 + 16 [1810 (before 28 May)], Fulltext.